Joining us today is Dr. Cuthbert Soup, President of the National Center for Unsolicited Advice and author of A Whole Nother Story, and the recently released, Another Whole Nother Story. We’re going to talk to the good doctor today about his work and his writing. 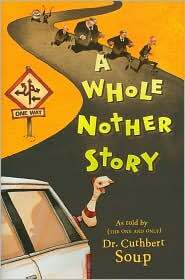 Maybe we’ll see if there is “Another, Another Whole Nother Story” in the works. Welcome to The Children’s and Teens’ Book Connection, Dr. Soup. It is an honor to have you with us. Can you please tell us a bit about your distinguished career? Thank you. I am honored to be here and I would be more than happy to share some of my many career highlights.It all began when I enrolled at Harvard Jr. College, whereupon graduating with honors, I transferred to Southwestern North Dakota State University and earned my Ph.D. in Unsolicited Advice. As the founder, president and vice president of the National Center for Unsolicited Advice I have traveled the globe, doling out advice to the masses as well as to celebrities and world leaders. For instance, I recently advised the Dalai Lama to change his name to Dolly Llama and become a female country western singer. I’m not sure if he/she ever took my advice as I’ve been very busy and have not had time to follow up. I know this is probably a silly question, but how is it that you ended up with three first names? Or is it two first names and a middle name? Or perhaps a first name and two middle names? You’re right. There is a very high probability that this is a silly question. However, there is also a very good chance that it is not. To find out for sure, I have had it sent off to the lab for analysis. While we eagerly await the results I will attempt to answer the question, silly or not. My full name is Cuthbert Hubert Egbert Soup, which includes one first name, two middle names and the last name, Soup, which was originally Schoupenstein but was shortened by immigration officials when my family moved from Austria to the United States. The fact that they chose to shorten my family name doesn’t really bother me, though, to be honest, it annoys the heck out of my cousin, Campbell. I understand you are a high school dropout. That doesn’t seem to have hampered your career. What are some of the jobs you held prior to becoming president of the National Center for Unsolicited Advice? When did you turn your attention to writing? It takes two to tango, but it takes four to tango with a giant squid. Quitters never win but, if both sides quit, it’s a tie. Bear in mind that those who say honesty is the best policy may be lying. Are your dog, Kevin, and your pet snails, Gooey and Squishy supportive of your writing? Gooey and Squishy, I would say, are more tolerant than supportive. They’re very busy with their own lives, training for the Iron Snail competition and hosting their own television program, the Gooey and Squishy Show. As for Kevin, he supports me one hundred percent because, with the proceeds from the book, he will finally get that operation he needs. Actually, he doesn’t really need an operation but he feels that a nose job would be beneficial to his acting career. So tell us, what will readers discover in A Whole Nother Story? They will meet my good friend and former classmate from SWNDSU, Ethan Cheeseman,his three smart, polite, attractive and relatively odor-free children, and their hairless, psychic dog, as they try and stay one step ahead of a host of nasty villains, all vying to get their hands on Ethan’s fantastic invention, known simply as the LVR, which stands for Luminal Velocity Regulator. I suppose it could also stand for Large Visible Rash but, in this case, it does not. The reason that the LVR has attracted so much attention from all kinds ofunsavory individuals, it that it is a time machine which, as you can imagine, could be used for all types of evil purposes. However, the Cheesemansare very much intent on keeping the LVR out of the hands of these villains because they need this marvelous invention for the most important reason of all; to travel back in time and save the life of Olivia Cheeseman, Ethan’s beautiful wife and mother to his three beloved children. 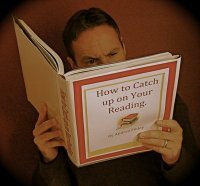 If readers visit your website at www.awholenotherbook.com and read an excerpt from the book, they might get the impression that you are fascinated by numbers. Would that be true? Fascinated by some, terrified of others and highly indifferent to a few. For instance, I could not be bothered in the least with the number eleven and others of the same tedious ilk. However, in this instance, I believe you are referring to those insidious, numerically named corporate criminals who work for Plexiwave, the world’s largest and most heartless weapons manufacturer. Mr. 5, Mr. 29, Mr. 88 and Mr. 207 are all numbers to be avoided at all costs. 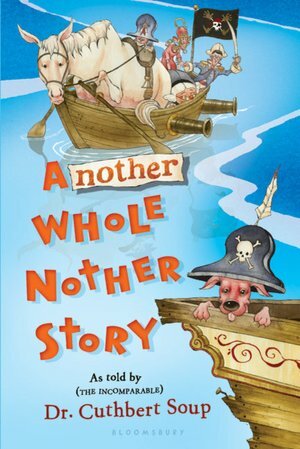 Mr. Cheeseman and his three children return in the sequel, Another Whole Nother Story, which was recently released by Bloomsbury Children’s Books. I understand this one involves some time travel. What new things will readers find in this book? Readers will find many new things in this book, including some never-before-used consonants and vowels (such as œ and §) that were only recently discovered by archeologists, digging in an area that is now known as France and was once known as Vr§gœ. Readers will also find the Cheesemans coming face to face with a very determined witch hunter, an extremely nasty band of pirates, a plagiarist ghost and a Danish duke who is not all that he appears to be. All the while they are being shadowed by two mysterious visitors from the future; one who is there to rescue them, the other to enact revenge. Now, if I were to ask for some advice, then it wouldn’t be unsolicited; so let’s assume we’re in a café somewhere in Vienna and we get to talking about writing for children. What type of unsolicited advice would you impart to me? I would advise you to bear in mind that children these days are a very sophisticated lot, especially when it comes to their understanding of humor. Therefore, when writing for children, one should avoid talking down to them and explaining too much. Also, whenever possible, use the word underpants. Where can readers purchase A Whole Nother Story and Another Whole Nother Story? Unfortunately, as of now, the book is only being sold in taverns and saloons, which I think is a ridiculous way to market a book written for children. Oh well, I guess the publishers know what they’re doing. What’s that? Oh, I see. I’m now being told that the book is also available in bookstores, on-line and wherever fine books are sold. And in taverns. Are there more of these books in the works? 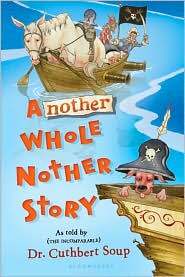 I am currently working on the third book in the series, the aptly titled Another Other Whole Nother Story. After that will come The Mother of Another Other Whole Nother Story, which will pretty much wrap up the series as I have little desire to write a book called, Brother From Another Mother of Another Other Whole Nother Story. We’ve talked about your website—which is superb, by the way—can you tell us if we can find you anywhere else on the World Wide Web? My web designer – the fabulous Chuck Gamble at Lucky Radish Studios – will be pleased to hear that you found the website agreeable. Other places I can be found on the web include Facebook and in a very unfortunate video featured on a website called WhenGerbilsAttack.com. As the founder, president and vice president of the National Center for Unsolicited Advice, I think it only appropriate that I leave readers with a bit of advice to help them through their everyday lives. Always remember: Before you judge someone, you should walk a mile in his shoes, which can be particularly difficult if the person you are judging is a circus clown. Thank you for a delightful chat, Dr. Soup. I hope you’ll come back and visit us again soon. It has been my pleasure indeed. Also, you’ll be happy to know that the lab results are back and, as it turns out, your earlier question contained only the smallest traces of silliness, thus securing your reputation as a serious journalist.